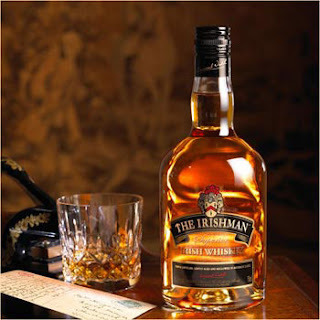 I mentioned recently that I tasted The Irishman whiskeys at a food festival and was quite taken by them. In particular, The Irishman 70 (also known as "The Irishman - The Original Clan" in the US) has a unique selling point. The "70" refers to the 70% malt whiskey content. In a normal blend the other 30% would be a light grain whiskey. Here, however, the "blend" is topped up with a flavourful pure pot still whiskey. This mix of malt and pure pot still is the signature style of The Hot Irishman company and this September or October we will get to try a cask strength version. This will be a vintage release of no more than 1,400 bottles. Most of these have been pre-allocated already and about 150 bottles will stay in Ireland. The price will be €130-€150. Bernard Walsh, who personally selects the casks that are vatted for The Irishman whiskeys, very kindly sent me a sample of this new cask strength release, which comes in at 56% ABV. The nose is a very pleasant rum-and-raisin fudge while the palate has a mouth-filling spiciness that lingers through a satisfying finish. The basic Irishman 70 has a squeaky, dry finish like chomping on fresh peanuts but I didn't get that here. I found that a few drops of water really opened up the flavour. I like this whiskey a lot. It's very expensive but you won't be indulging in this robust spirit every day anyway. Save it for when you really want to notice what you are drinking.